What will you remember most about the 2017 Mets season? When you look back on this Mets season in 15 years—assuming, of course, that the world has not been destroyed in a nuclear war by then, and baseball still exists in its current form—what will stand out the most? Yes, the injuries were a major issue. And yeah, the hitting could have been better, too. But what will probably stand out more than anything else in most fans’ memories about this season is the shockingly abominable display of pitching we’ve seen from this entire pitching staff. This was a staff that was supposed to be a top-five unit in the league. And even if you accounted for injuries, it still projected to be a decent unit at worst. But instead, it’s been a bottom-five unit all year long, and it was the major factor in the undoing of this entire team. I could hit you with the numbers (again), but the shock value that contextualizing it in numbers once had no longer even really exists; it’s mostly just numbing at this point. For example, I could say that seven of the 12 Mets pitchers with the most innings pitched this year have ERAs over five. But that’s not really surprising at this point. I could also mention that as of Tuesday, the team’s 117 ERA- is the fourth-worst in franchise history. But that’s whatever by now. I could even bring up the fact that if you remove Jacob deGrom’s stats, the team ERA, even before last night’s game, would be 5.08, which would be the worst team ERA in franchise history—six points worse than the 1962 Mets. Okay, that one still stings a little bit. And last night, we saw another disheartening performance from a pitcher who not only had a positive outlook coming into the year, but who was, and still could be, a huge part of this team’s future. It has been a completely lost season for Robert Gsellman—who BP ranked as the #2 prospect in the Mets system pre-season—and it took another saddening turn last night in Chicago. Gsellman worked through the first three innings without allowing a run, but was walking the tightrope the entire time and completely lacking command. 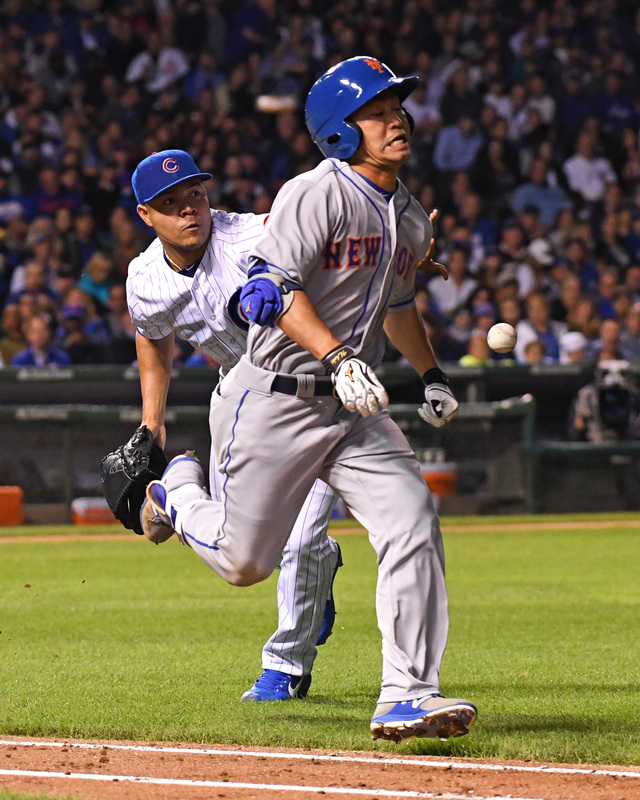 He finally cracked in the fourth inning, when he allowed a four-spot to the Cubs, with three of those runs coming on a home run by Kris Bryant. Gsellman walked four on the night and gave up five hits in just four innings of work. Next year, the Mets will have a cornucopia of pitchers bidding for spots in the rotation. Only two spots are guarenteed: deGrom and Noah Syndergaard. Everyone else will need to earn a spot. This month of September is crucial for guys like Gsellman and Seth Lugo to build their case for a rotation spot next season, and Gsellman’s outing last night did not help, as his stock continues to plummet after a wonderful 2016 debut campaign. The game was pretty much over from there. Tommy Milone, Jacob Rhame, Josh Smoker, and Chris Flexen all pitched the subsequent innings in that order, and every single one of them gave up one run. Milone is a guy who probably shouldn’t even be pitching for the Mets anymore, Rhame is still working out the kinks at the MLB level, and Smoker and Flexen haven’t looked like MLB-caliber pitchers all season. The Mets lost the game 8-3, which ultimately doesn’t matter. What does matter, though, is that they were able to find innings for Rhame and get some more evaluation on Gsellman and Smoker. In addition, Amed Rosario had a productive day, going 2-for-4 and making a nice leaping grab in the field. Rosario’s yet to light the world on fire, but it absolutely looks like being a competent MLB shortstop is his floor right now. Dom Smith’s struggles continued, however, as he went 0-for-4 with four strikeouts. Gavin Cecchini and Brandon Nimmo were both benched again last night, which is good. Very prudent. The Mets also called up catching prospect Tomas Nido to the big leagues yesterday. The 23-year-old posted a 74 wRC+ for the Binghamton Rumble Ponies this season. The Mets play game two of their series against the Cubs in Wrigley Field. Matt Harvey takes on Jon Lester in a rematch of Game 1 of the 2015 NLCS, except both pitchers are discernably worse now. First pitch is scheduled for 8:05 p.m.